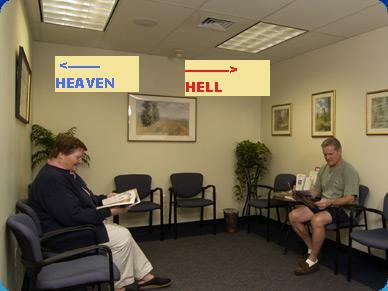 “Extreme Atheist” causes trouble in afterlife waiting room. Home → Damien Zone → “Extreme Atheist” causes trouble in afterlife waiting room. 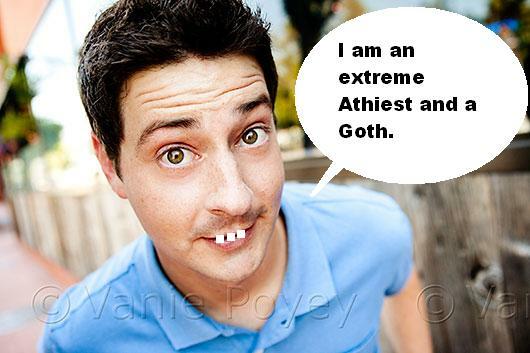 “There is no reason why I should sit here and wait to be judged by anyone,” said world famous “extreme atheist” and pagan goth, Carney Dunroven just moments after he was struck and killed by a bus and found himself in the waiting room adjacent to the gates of Saint Peter. It seems that the late Mr. Dunroven seemed to be missing the point or something as he continued his rant at the terribly understaffed heavenly gate and had to be ushered away by Tony Curtis — who, it turns out, must have been a very nice guy. “I have to laugh,” chuckled Saint Peter as he went through his filing cabinet. Dunroven just won’t give in, and when it was explained to him that no matter how many times you vaporize someone they still end up in the same place, his anger reached the boiling point of realization. Dunroven’s number was eventually called and he tried to talk his way out of the extreme atheism thing at his judgement but nobody wanted to hear him. He can be reached at extension 566787764224422. Don’t keep him long because the phone is hot. Albert Einstein and Marilyn Monroe were the same person. That was intellectually stupid, morally bankrupt and comedically uninspiring. Morally bankrupt? So you liked it? The last sentence here, a quote from somebody you call Dottie Beany, is the funniest thing I have read in months. I did not even see that coming. You are a very witty person.